People go to their coffee shops to drink coffee and to hang out and talk. Sure, they probably talk about the coffee sometimes (#dunkindonuts and #starbucks), so directing what else they talk about might seem to be a no-brainer, and a way to effect some positive change in society. 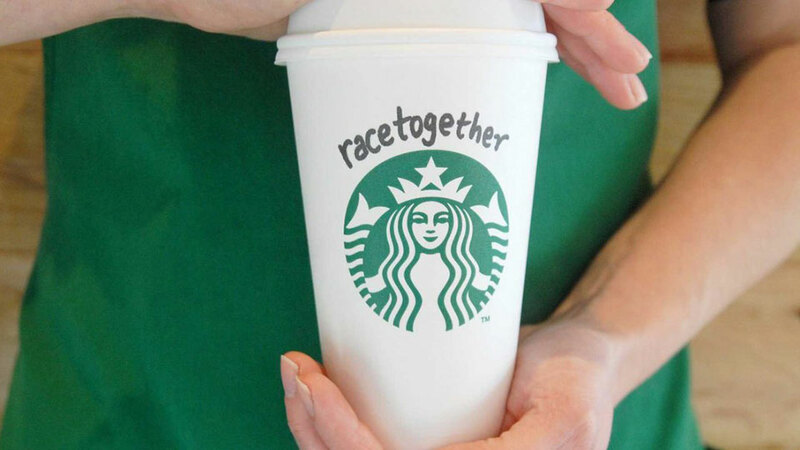 Starbucks are trying to say something about Race with their new Race Together campaign … they have even started a hashtag (#racetogether). It isn’t necessarily going down very well, as people question the thinking behind it, firstly for its naivete, and secondly for the idea that it seems to be trying to capitalize on what is a very fraught subject at the moment. Not that racial tensions aren’t always something of a powder keg, but if you turn on the news it is definitely more front and center than it has been in a while. Getting political as a company isn’t always the smartest move – it can be a little like when Bono or some other earnest rock star starts hob-nobbing with politicians and telling people about their latest hobby horse (the opinion could be totally valid, but a lot of people feel that it is over-stepping the mark, that it is not in the job description). Of course if you or your product is political in nature to begin with, then that is what people sign on for when they exchange money with you, so they’re not going to object to it. Dunkin Donuts want you to talk about your Dunkin experience, and though I haven’t done it personally, I am sure some people do. I mean, I talk about what happens when I go in the shop, I just don’t necessarily tweet about it … unless they are offering me a free coffee for doing so. Is it such a bad thing to want to up the level of conversation to something with a little bit more weight? Does it have to be a cynical exercise? There are always forums to talk about these kind of socio-political issues and Starbucks does try to engage its customers, who tend to be quite urbane and somewhat in the hipster vein. It isn’t that the whole idea doesn’t align with their brand image – that of being a little more conscious of what is going on in society; it isn’t that talking about these kinds of things doesn’t help – it just seems to be who it is throwing their hat in their ring and starting up the dialogue. Howard Schultz CEO of Starbucks has been defending the idea; getting workers to write the hashtag on cups, and discussing an intention to publish conversation guides – he says the intention is pure. One thing is true: even if it doesn’t get the thumbs up for everyone as a great idea, it has got people talking about the subject, and now Starbucks is being talked about too. Better to get press about a failed idea with good intentions than to not have people talking about you at all.